Pay TV services on Sky Italia satellite platform are encrypted in NDS VideoGuard. The VideoGuard set-top boxes that have been provided since July 2010 are identical to the Sky+ HD boxes used in the UK. Pace, Amstrad (itself owned by Sky) and Thomson, all Digibox licensors, have been producing Sky Italia boxes (Sky Box, Sky HD, My Sky and My Sky HD) identical to their Sky Digital, Sky+ and Sky+ HD offerings, albeit with the potential removal of the second card slot and UHF modulator. Sky Italia was founded in July 2003 by the merger of TELE+ and Stream TV. Since July 2010 Sky Italia has been giving the 'Sky Digital Key' and the My Sky HD box for free to every new customer (since July 2009 HD channels have been available with no extra cost to all Sky Italia subscribers). The 'Sky Digital Key' is a USB device which has to be connected to the 'My Sky HD' box and to the aerial cable, allowing the customer to receive every DTT SD and HD free channel on the Sky HD or My Sky HD box. 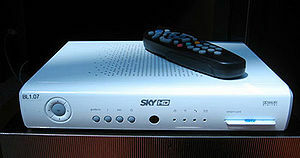 The 'My Sky' boxes launched on 22 November 2005 - based on a new digital receiver with HDD recording capabilities and surround sound output (not previously available on the normal box). Subsequently, the 'My Sky HD' boxes (High Definition with HDD recorder) were added. The 'My Sky HD' service had been provided with an extra charge until July 2010, when it became a base-line service. The service is functionally identical to the BSkyB Sky+ HD. On 28 June 2010, Sky Italia changed its brands and logos, making them identical to the BSkyB ones. Sky Italia offers eight packages of channels: five base-level 'Channel Packs' and three optional 'Sky Packs' enhancements. The 'Channel Packs' are: 'Entertainment' with 33 variety, series and semi-generalist channels (3 of them in HD); 'Documentaries and Lifestyle' with 17 channels (2 of them in HD); 'Music' with 16 channels and 27 audio channels; 'Kids' with 21 channels; 'News' with 15 national, local and international news channels and 5 basic sport channels. The 'Sky Packs' are the following: 'Cinema' with 12 movie channels (10 of them in HD), and a 3D channel, Sky Cinema 3D (PPV Sky Primafila movies are 50% off for 'Cinema' subscribers); 'Sport' with 8 channels (5 of them in HD), and a 3D channel, Sky Sport 3D; 'Calcio' with 15 channels (9 of them in HD) covering Italian and international football, the most popular sport in Italy, along with Sky Sport 24 (sport all-news channel), offered as bonus channel for 'Calcio' subscribers. The 'Sky Primafila' service offers pay-per-view movies, sport events and adult content (at night); the pay-per-view movies and some non-sport events are disseminated in 28 'Primafila' channels (8 of them in HD); one channel airs daily Penthouse TV HD programmes, available as a stand-alone premium channel. Sky Primafila has got some similarities to BSkyB's Sky Movies Box Office. The HD service has been offered without any extra charge since 2009. There are 37 HDTV channels so far broadcasting on Sky, due to become 50 by the end of 2011. On 1 October 2010, Sky activated its first 3D channel, Sky Sport 3D, available without any extra cost to the Sport pack subscribers. The very first event Sky Sport 3D aired was the 2010 Ryder Cup. On 25 December 2010, Sky launched another 3D channel: Sky Cinema 3D, airing 3D movies, available for free for Cinema pack subscribers. These channel have been replaced by Sky 3D on 6 September 2011. On many channels, foreign-sourced content is broadcast either with an option to choose between Italian and English language soundtracks (rarely other languages), or with Italian subtitles. Sky Italia uses the Hot Bird 6/8/9 satellites at 13.0°E, the same satellite fleet used by RAI, Tivù Sat, NOVA Greece, NOVA Cyprus, Cyfra+ and Cyfrowy Polsat. Tom Mockridge, the then head of Sky Italia replaced Rebekah Brooks as chief executive of News International after she had resigned on 15 July 2011. Andrea Zappia replaced Tom Mockridge as CEO on 1 August 2011. On 7 October 2011 Sky Italia announced it reached the 5 million subscribers benchmark. Following News Corporation's split into two on 28 June 2013 to create two separate companies, 21st Century Fox (the re-branded News Corporation), and the spin-off company New News Corp, the 100% stake held by News Corporation in Sky Italia was retained by the re-branded 21st Century Fox. March: the European Commission approves the merger between TELE+ and Stream TV. 31 July: Sky Italia is founded. At the same day, Sky TG24 is launched as a rolling news channel. April: Sky Italia abandons SECA encryption system to switch to the NDS, managed by the News Corporation. 1 August: Sky launches weather news channel, Sky Meteo24. November: Sky's subscribers reach 3 million. May: Sky Italia are awarded the broadcast rights to the 2006 FIFA World Cup. November: Sky Italia launches the MySky decoder with PVR functionality. May: Sky launches its first high definition channels: Sky Cinema HD, Sky Sport HD, National Geographic Channel HD and Next:HD. December: Sky's subscribers reach 4 million. April: Fox airs the first TV drama created by an Italian pay television channel, Boris. May: Sky are awarded the broadcast rights for Formula One for two and a half years. November: A selection of Sky channels become available via IPTV on Telecom Italia, Fastweb and Wind. February: Sky are awarded the broadcast rights for the 2012 Summer Olympics. May: Sky launches MySky HD. 30 August: Sky launches sport news channel, Sky Sport 24. December: VAT on subscriptions is increased from 10% to 20%. January: Sky are awarded the broadcast rights for the FIFA Confederations Cup and the Six Nations Championship. April: Sky launches Sky Uno and Sky Primafila HD. August: Sky increases its high-definition offering to 12 channels. September: Sky announces the Sky Digital Key, a USB Key with decoder functions. Sky On Demand service launches. Sky launches free-to-air channel Cielo. January: All Serie A matches begin transmitting in high-definition. April: Sky launches three Sky Movies channels in high-definition, bringing the total number of HD channels to 25 channels. Sky changes its brand identity with a new logo, similar to that used by BSkyB. Mondiali 1-4 launch for the 2010 FIFA World Cup. August: The number of high-definition channels reaches 36. October: The 2010 Ryder Cup final is the first sport event to be broadcast in 3D. Sky's subscribers reach 4.8 million. January: Avatar is the most watched film on Italian pay TV, with an audience of 1.3 million viewers. February: Sky are awarded the broadcast rights for the 2011 Copa América, 2011 and 2012 Copa Sudamericana and 2012 Copa Libertadores. March: Sky Cinema Passion and Sky Cinema Comedy launch. May: Sky are awarded the broadcast rights for X Factor. August: Sky launches Sky Go, an app which allows a number of Sky channels to be viewed on smartphones and tablets. September: Sky launches Sky 3D, the first 3D channel in Italy. Sky's subscribers reach 5 million. Sky Uno begins broadcasting in HD for the premiere of X Factor. Sky's HD channels reach 40 with the launch of Eurosport 2 HD. 12 new HD channels are launched, Fox Life HD, Real Time HD, Extreme Sports Channel HD, ESPN America HD, Discovery Science HD, Discovery Travel & Living HD, History HD, Nat Geo Wild HD, Nat Geo Adventure HD, Gambero Rosso Channel HD, Disney Channel HD and MTV Live HD, bringing the total number of HD channels to 52. Sky changes the operating system of MySky HD. March: Sky Go becomes free and is made available for PC, OS X, iPhone and Android. May: Sky are awarded the broadcast rights for the Grand Prix motorcycle racing for the 2014, 2015, 2016, 2017 and 2018 seasons of MotoGP, Moto2 and Moto3 series. Sky are awarded the broadcast rights for the Formula One and its feeder series (GP2, GP3 and Porsche Supercup) for the 2013, 2014 and 2015 seasons, with an option for the 2016 and 2017 seasons. The launch of Sky Arts is announced. Sky updates the OnDemand service. Sky are awarded the broadcast rights for the UEFA Champions League for the 2012–13 and 2013–14 seasons. Sky adds 12 extra channels for the 2012 Summer Olympics. August: Sky's subscribers reach 4.9 million. Sky TG24 receives an on-screen rebrand. Sky adds two more high definition channels: DeA Sapere HD and Disney XD HD. October: Planet Kids, a new channel for kids, is launched. 1: Sky Arts launches in HD, bringing the total number of HD channels to 58. Sky Go is updated to include three more channels and Sky OnDemand. February: Sky's subscribers fall to 4.83 million. March: Sky are awarded the broadcast rights for the Bundesliga for two seasons. 3 April: Cielo launches in HD. May: Sky's subscribers fall to 4.78 million. July: Sky are awarded the broadcast rights for 2014 Winter Olympics, but transfers the rights for the 2016 Summer Olympics to RAI. 9 August: Fox Sports launches on Sky and Mediaset Premium, broadcasting the Premier League, the FA Cup, La Liga and Ligue 1. September: Sky TG24 launches in high-definition, bringing the total number of HD channels to 63. October: Classica and MTV launches in high-definition, bringing the total number of HD channels to 65. November: Sky's subscribers fall to 4.76 million. December: Sky Go launches on Windows Phone. February: Sky are awarded the broadcast rights for Italia's Got Talent and the UEFA Europa League for 3 seasons. 10 March: Sky Sport MotoGP launches. 9 April: Sky Atlantic launches, broadcasting American, Italian and European TV series. August: Sky are awarded the broadcast rights for the Lega Basket Serie A for 2 seasons. December: Sky are awarded the broadcast rights for the Premier League for the 2016-17, 2017-18 and 2018-19 seasons. May: Sky are awarded the broadcast rights for the EuroBasket 2017, EuroBasket Women 2017, 2018 FIBA Women's Basketball World Cup, 2019 FIBA Basketball World Cup, EuroBasket Women 2019, EuroBasket 2021, AfroBasket 2021, AmeriBasket 2021, 2021 FIBA Asia Cup and EuroBasket Women 2021. Sky are awarded the broadcast rights for the NBA for the 2016-17 and 2017-18 seasons. Sky's subscribers rise to 4.67 million. Sky are awarded the broadcast rights for the 2017 FIFA Confederations Cup. Sky are awarded the broadcast rights for the UEFA Champions League and UEFA Europa League for the 2018/19, 2019/20 and 2020/21 season, and for the 2018, 2019 and 2020 UEFA Super Cup. Sky HD is the brand name of the HDTV service launched by Sky Italia on 20 April 2006 in Italy - during the 2006 FIFA World Cup - to enable high definition channels on Sky Italia to be viewed. The service requires the user to have a Skybox HD (distributed by Sky Italia), and a HDTV with HDCP enabled. A HD PVR decoder called My Sky HD was launched on 26 May 2008 (on 20 December 2008 was sold a particular edition designed by Fendi in favour of the international organisation Child Priority). The first generation of Sky Box HD were produced by Amstrad and Pace. ^ "Communicating Europe: Italy Manual" (PDF). European Stability Initiative. 19 May 2008. Retrieved 23 November 2014. ^ Samira Shackle (15 July 2011). "Ed Miliband calls for the break-up of the Murdoch Empire". New Statesman. Retrieved 28 June 2013. ^ "Sky: Andrea Zappia nuovo ad Sky Italia". ANSA (in Italian). 8 January 2011. Retrieved 28 June 2013. ^ Statement on potential acquisition, BSkyB 12 May 2014. Retrieved: 19 June 2014. ^ "'Sky Europe': what is behind BSkyB's effort to buy Murdoch's European pay-TV businesses?". The Daily Telegraph. 12 May 2014. Retrieved 19 June 2014. ^ "BSkyB to pay $9 billion to create Sky Europe". Reuters. 25 July 2014. Retrieved 25 July 2014. ^ "Sky creates Europe's leading entertainment company". Sky. 13 November 2014. Retrieved 13 November 2014.